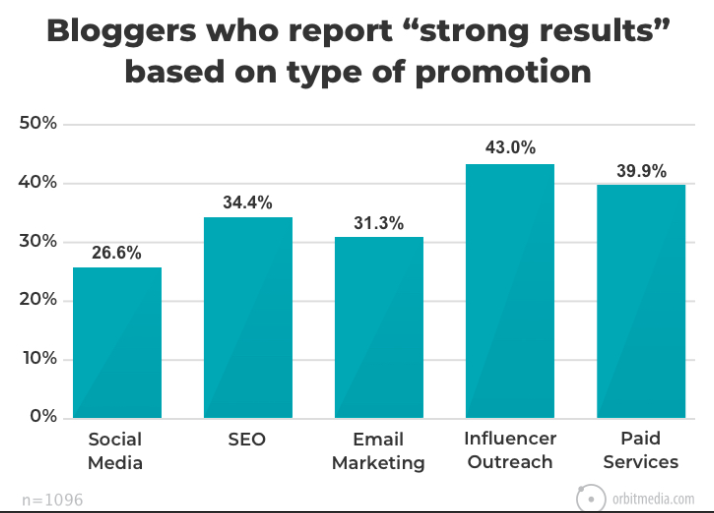 Each year, something called “Orbit” (don’t worry, I had to look it up, too) publishes a survey of 1,000+ bloggers on best practices in the industry. I now pay attention to this survey if for no other reason than there just aren’t that many surveys of bloggers like this around anymore in 2018 (which, actually, is hard to believe). Anyway, the survey polls bloggers, but I believe some of the lessons learned also pertain to people like us who manage corporate blogs. Again–there aren’t that many data sets like this that are showing trends year-over-year. In this case, Orbit now has five years worth of data. Longer posts are outperforming shorter posts. 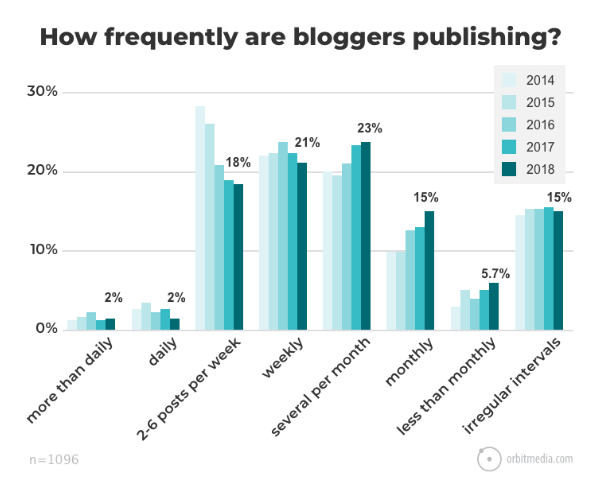 And, more bloggers are posting long-form content than in 2014. 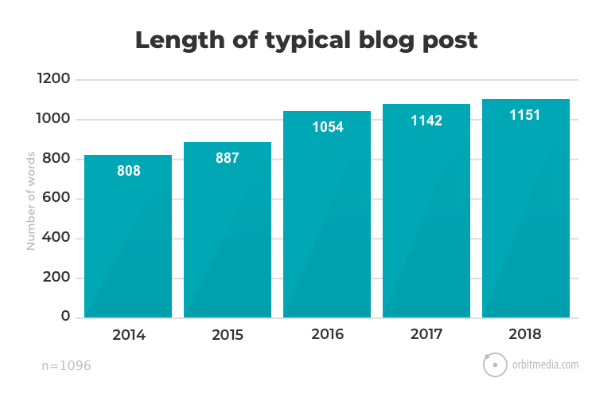 In fact, the average blog post length in 2018 is now 1,151 words. Whereas, in 2014, it was just 808 words. 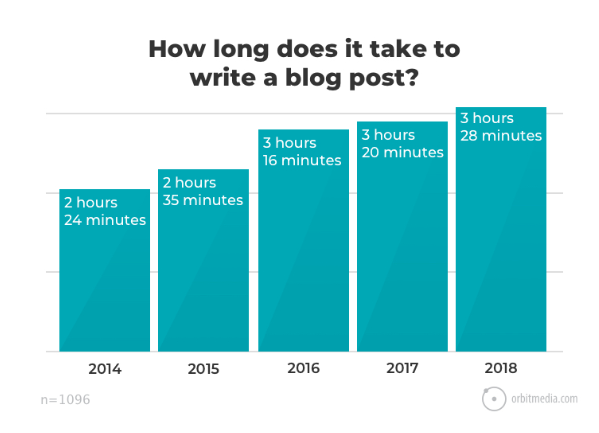 To look at it another way, in 2014, it took the average blogger 2 hours and 24 minutes to write a blog post. In 2018, that number has spiked to 3 hours and 28 minutes. More than an hour longer! Finally, the most important stat. 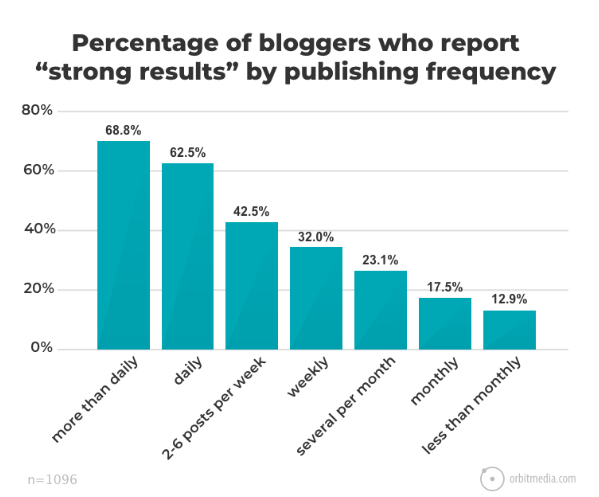 39% of bloggers who reported “strong results” invested 6-plus hours in writing their blog posts. 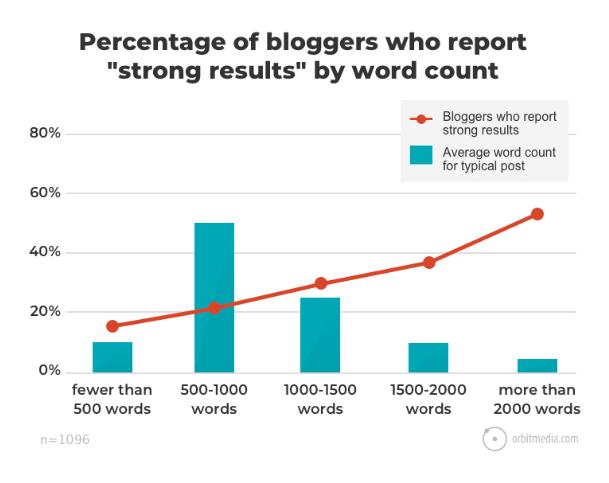 And, posts that were more than 2,000 words consistently drove “strong results” among these bloggers. 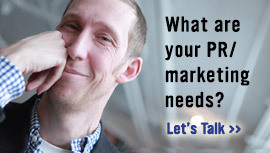 This is a trend worth noting for corporate blogs, too. People want in-depth content with more detail in 2018–not “snackable content”, a concept we all bought into years ago. Customers will invest the time it takes to read a 1,500-word blog post if it’s content that’s well-researched, well-written and offers up a unique perspective. That’s content that takes 6-plus hours to write. I see this with the clients I’ve worked with the last couple years, too. Longer content is resonating over shorter-form blog content. In fact, 21% are publishing monthly or less than monthly–up from 13% in 2014. While those who posted “2-6 times per week” is down from 28% in 2014 to just 18% in 2018. I don’t know about you, but I don’t see too many corporate blogs publishing daily. That’s just not happening with any degree of regularity. 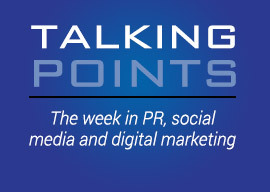 What’s much more common is a posting frequency of several times per month–or, even monthly. Posting daily is almost impossible for most brands. But, the truth is, brands don’t need to be in the publishing daily business. Even a handful of posts a month, generally, will produce results. After all, in many ways, blogging is a big search play. And, merely have a steady diet of content (even if it is just 3-5 times per month), can usually make a big difference. Publishing daily, for brands, feels like overkill. But, the funny thing is: It’s not working. Social media is still, without question, the number one tactic bloggers use to drive traffic. But, in 2018, when social media is all about pay-for-play, it’s interesting that bloggers haven’t adapted. 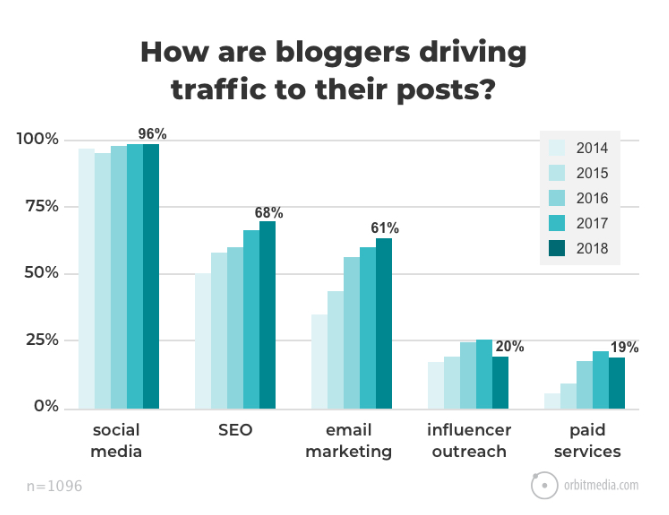 In fact, only 19% of bloggers said they used “paid services” to drive traffic to their blogs. Meanwhile, when it came to tactics that drove “strong results”, influencer outreach and paid services topped the list. And, social media ranked dead last. This is a mistake I see brands making all the time. They take the time to develop great blog content, and then completely forget the rules about how to distribute and promote it. Paid media like Facebook and LinkedIn advertising are key to sharing corporate blog posts on social media. Gone are the days when you can simply share your corporate blog post on Facebook, Twitter and LinkedIn and expect any semblance of traffic. Corporate blog distribution practices are now all about paid distribution. The findings align with that. 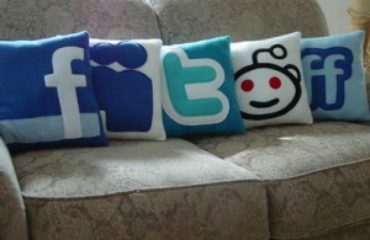 Social Media Trends: What’s hot for 2011?